There’s something to be said for young adult books that are actually written the way a teen might actually talk…and then there’s something to be said for young adult books that assume all teens are incapable of articulating themselves well. I’m not sure if the latter is where Jennifer Brown actually falls, but this book definitely suffered from being written as if it was trying to mimic a teen voice. The basic plot of the novel is that Valerie, our main character, is a survivor of a school shooting that killed many of her classmates and a teacher. Valerie is a hero who stopped the shooting by throwing herself in front of a potential victim, triggering the shooter to end his rampage by killing himself. The twist is that the killer was Valerie’s boyfriend, who she kept an extensive “hate list” with: a list he used to choose his victims. Many of her fellow students, the media, and even her parents hold Valerie partially to blame for the shooting, and she struggles with this as she tries to navigate through her trauma. Really great idea for a plot, right? I agree, and the basic structure is well done. The book has a great message of forgiveness both of oneself and of others, and many of the characters and their actions ring true. However, the voice of the novel just does not ring true at all, and some actions (by the parents in particular) are so egregious they feel like a comic villain. I understand of course that there are many horrible people out there and plenty of parents act terribly towards their children, but when you pile too much suffering on any one character, especially a young adult character, it can read like Lurlene McDaniel But With Guns Instead of Cancer. I think I must be missing something here because this book is very well reviewed on Goodreads. But I did not enjoy it. 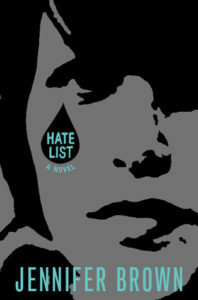 Share the post "I Didn’t HATE Hate List…But I Didn’t Like it Either"